Delonghi Ariadry Light DNC65 Dehumidifier Review - Buy or Avoid? 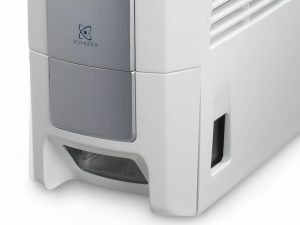 Home » Desiccant Dehumidifiers » Delonghi DNC65 Dehumidifier Review – Does The Tasciugo Ariadry Light Live Up to Expectations? The Delonghi DNC65 is a great dehumidifier for small-medium rooms and garages. It's fast to remove water and the desiccant design allows it to remain effective even in cooler conditions. It's let down by the small water tank and average energy efficiency though. 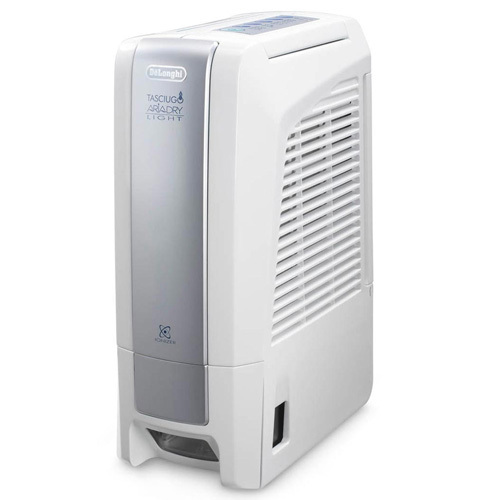 The Delonghi DNC65 dehumidifier has been around for a LONG time – since 2004 to be exact. This shows, if nothing else, that it’s a reliable and effective model for UK weather conditions. It’s also marketed as quiet and quick to dry out a home, which is vital for a modern dehumidifier. Even though the DNC65 is clearly a robust model, we wanted to find out how it compares to other models. Does it pull water out of the air faster than competitors? Is it as energy efficient as more recent dehumidifiers? And is the specification worth the money? Keep reading our DNC65 review to find out. 4.1 Where to Buy The DNC65? The first thing to note is that the DNC65 is a desiccant dehumidifier (see here for more examples of compressor free models). 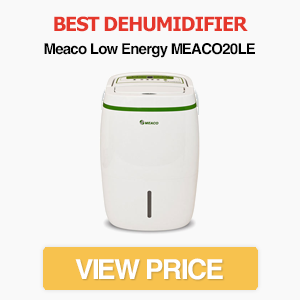 This type of dehumidifier is more effective in cooler conditions than a refrigerant model and tend to work better in lower humidity conditions. They also provide a mild heating effect. The DNC65 is a relatively compact dehumidifier. With a width of just 32cm and depth of 18.7, it rivals some of the smallest models we’ve reviewed. This makes it easy to store and you won’t need a huge space for it to operate effectively. Delonghi recommends leaving at least 20cm space between the back and the wall, with the same distance for the sides. The filter side should be placed a minimum of 50cm away from a wall for optimum operation. Make sure you check the size of the area you want to use it including these extra spaces before you buy. Despite being designed over a decade ago, the DNC65 doesn’t have an old-fashioned appearance. While a dehumidifier is never going to be a decorative item, the slim white design with silver side panel means it won’t ruin your interior décor. It’s also very light. Weighing just 6.5kg, it’s one of the lightest dehumidifiers on the market. A potential downside is that it emits a noticeable smell. This is strongest when you first buy the machine, although fortunately it seems to fade over time. Note: The operating range is 1°C to 40°C. The dehumidifier will automatically deactivate and switch to fan only mode in these conditions. It’ll also shut down if the humidity falls below 20%, as failure to do so could damage the machine. A downside of the compact design is the relatively small water tank. At just 2 litres, it’s considerably smaller than models such as the EcoAir DD322. You’ll need to empty it regularly – especially in humid and wet environments, or if you’re using the clothes drying mode. This tank is also stiff to open, which can mean it spills easily. The good news is there’s a continuous drainage function. This lets you use a hose to continuously flush water down a drain, although this may not be possible if you don’t have a low-level drain nearby. The tank is located on the side of the machine (Delonghi calls this the “front”, but we think it’s the side!). This makes it a little more difficult to empty, as if it’s against a wall you’ll need to move it. The water level is visible though, so you don’t need to open the tank just to check how full it is. It also has a shut-off system once the tank is full. This is an essential feature – especially as the small tank is likely to fill up fast. As we mentioned, the DNC65 is a lightweight dehumidifier at just 6.5kg. This, combined with the built-in handle, mean it’s easy to move around the home. It doesn’t have castor wheels, which is a shame. Wheels aren’t as important as on heavier models though. On a side note, the lightweight and portable design doesn’t make it feel unstable. This is a sturdy and well-made machine that should last a long time. As you would expect from a dehumidifier that’s stood the test of time, the Delonghi DNC65 is excellent at drying out a room. Don’t let the relatively low maximum extraction rate of 6 litres per day fool you – if you need to dry a medium-size home quickly, it’s one of the best. The fast extraction capabilities make it a great choice for damp homes. Many houses in the UK were built in the late 1800s or early 1900s, which can mean they suffer from a lack of insulation, mould and condensation. This model can solve these problems quickly and relatively quietly. The Delonghi DNC65 is particularly effective at removing moisture in cooler conditions. Unlike refrigerant models, which struggle once the temperature drops below 15 degrees Celsius, it still dehumidifies rapidly at 10 degrees Celsius. This makes it great for garages or unheated rooms. There are three dehumidifier levels: MIN, MAX and AUTO. The MIN mode is useful for maintaining humidity, as it’s very quiet (34dB) and conserves energy. MAX is for when you need to reduce humidity as quickly as possible, while AUTO uses the built-in humidistat to maintain a humidity of around 55%. Like many dehumidifiers, an anti-bacterial filter is included with the DNC65. This, along with the separately controlled ioniser, allows the dehumidifier to pump out cleaner air with fewer allergens. A useful feature is the oscillating louvres. These optimise the distribution of air from the dehumidifier when using the SWING function. 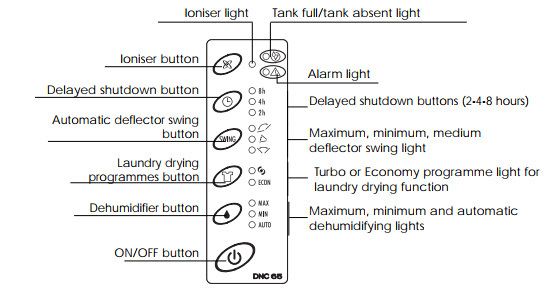 The DNC65 also comes with a clothes drying mode, frost protection system and electronic timer (up to 8 hours). With an extraction capacity of 6 litres/day and a relatively small water tank, the DNC65 isn’t built for large homes. It does a good job of reducing the humidity in areas up to around 75m³ though. On its “Low” setting, the DNC65 is ultra quiet at just 34dB. 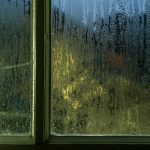 While this isn’t silent, it’s barely louder than ambient sounds – and compares well versus other dehumidifiers. The noise increases to 44dB when on “Max” mode, but this is still lower than many dehumidifiers on the market. One of the biggest drawbacks of the DNC65 is its energy efficiency. It’s not terrible in this regard, but it can’t match the energy-saving features of newer models. If you need a dehumidifier that can run 24/7 with minimal power consumption, we recommend looking at other models. But if you don’t mind a dehumidifier that’s around average for energy efficiency, the DNC65 is still a great choice. The DNC65’s touch control panel is located on top of the machine, so it’s easy to access at all times. 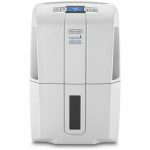 It doesn’t have many advanced features or a digital display, which is the case with most desiccant models, but is simple to use. Ioniser. The first button controls whether the ioniser is active or not. When activated, the dehumidifier creates a static charge around contaminants which causes them to stick to surfaces rather than float around. Tank Full and Red Alarm Lights. Next to the ioniser light are lights indicating an error or if the tank is full. A light also switches on if the tank hasn’t been replaced correctly. Delayed Shutdown Button. If you want the dehumidifier to run for a set length of time, this function allows you to choose between 2, 4 and 8 hours. While this function is common to most dehumidifiers, it’s great if you’re going out and don’t want the dehumidifier running all day. Louvre Deflector Swing Button. Pressing this button allows you to cycle between Max, Min and Medium deflector swings. The MAX mode delivers air vertically and forwards, while the second and third options deliver it forwards or vertically respectively. Laundry Drying Mode. This button lets you turn on the Turbo laundry drying mode. You can also activate a slower but more energy efficient Economy mode. Dehumidifier Setting. This is the most important button, as it lets you choose between MAX, MIN or AUTO dehumidifier modes. Keep in mind that the AUTO mode aims for a humidity of 55% before automatically switching to fan mode, and only switches back on if the humidity rises. You’ll probably want to test the various settings to see which works best in your home. As with any dehumidifier, make sure you read the DNC65’s user manual carefully before you start using it or for troubleshooting tips. You can find the PDF instructions on Delonghi’s official website if you lose the original. The manual contains instructions on how to address problems (such as the fan not working or device stopped switching on) or what to do if the warning light is on. You can also contact Delonghi for parts, to report a fault or if a repair is required via their website. It’s generally a reliable model though. It shouldn’t need much maintenance other than cleaning the tank and filter. Considering the DNC65 is a highly effective dehumidifier with decent specs, we think it’s fairly priced with an RRP of £219.99. This puts it at the higher end of dehumidifiers, but we think it’s worth the money. There are often deals and sales where you can buy the DNC65 for cheaper. The best price we’ve seen varies depending on where you buy, but if you can get it for close to £205 we think it’s a great deal. Where to Buy The DNC65? The DNC65 is often available at all the major online retailers, including Amazon, John Lewis, Ebay, Argos and Currys – although stocks and availability vary so we can’t guarantee which are currently selling it. You can also find it at many offline shops, although you usually get a better price when buying online. The Delonghi DNC65, or DNC65 Tasciugo Ariadry Light to give its full name, is a solid dehumidifier. 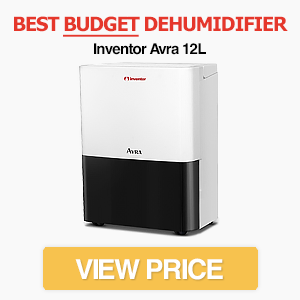 While it’s not quite good enough to deserve a place on our list of the best dehumidifiers (see here), it’s great if you’re looking for a quiet model or dehumidifier with an ioniser. It’s not the most energy efficient though, which is something to keep in mind before buying.